Following their victory over Clann Baoiscne, Clann Morna are hungry for power. Meanwhile, a mysterious war party roams the ‘Great Wild’ and a ruthless magician is intent on murder. In the secluded valley of Glenn Ceoch, a disgraced druidess and a woman warrior have successfully avoided the bloodshed for many years. Now, the arrival of a pregnant refugee threatens the peace they have created together. The odds are overwhelming and death stalks on every side. A very good mix of tension, full on adventure and fascinating characters set in ancient Ireland made this a very enjoyable read. The two main characters Liath Luachra (a disturbed warrior woman) and Bodhmhall ( a druid with a dark past) have established an idyllic oasis of peace in the wilds of ancient Ireland until they're disturbed by the arrival of Bodhmhall's ex-husband (a hilarious Fiacail mac Codha) and her conniving sister-in-law Muirne Munchaem. Pregnant and desperate, Muirne is fleeing not only from the threat of an enemy tribe (Clann mac Morna) but some terrifying, unknown enemy who wants to kill her unborn son. The spirited defence of the tiny and isolated community against a horde of gruesome warriors is absolutely nail-biting stuff. The love triangle between the three main characters meanwhile, is touching without ever being mawkish or over-sentimental. I can't recommend this book enough. This was an interesting book I obtained because of a freebie prequel by the same author. It reads a bit like David Gemmell but with much stronger female characters. 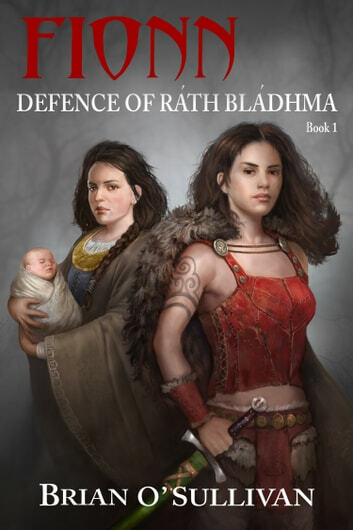 There's a very nice mix of action, clever dialogue and a mounting tension up to the dramatic finale but it's the touching relationship between the woman warrior (Liath Luachra) and the druid Bodhmhall (and little references to Celtic culture) that really made this book for me. I became a fan of O'Sullivan because he consistently writes plots with gripping tension, great dialogue, and strong female characters. This action packed yarn of a siege in ancient Ireland certainly was definitely one of the most enjoyable books I read over the last year. If your only experience of Irish mythology is from fairy tales in children's books, then this will come as a real eye-opener. It uncompromising tone has more in common with George RR Martin than Lady Gregory. There's very little overt 'magic' featured, and the story works all the better for it. The setting is very authentic to the reality of pre-Christian Ireland and it's clear the writer knows his stuff. Saying that, the book's main strength is its characters, particularly Bodhmall and Liath Luachra. As a result, you don't really care that Fionn doesn't appear till halfway through, and only then as a newborn baby. This series is like nothing else in Irish fiction, and is highly recommended. In the aftermath of a great battle, a small band of women, children and elderly people must defend their fort in a hidden valley from the invaders. O'Sullivan's tells the tale at a perfect pace and introduces the characters through the story, along with events from the past.